A recent public forum for an open seat on the Fullerton City Council revealed that over 90% of the candidates oppose a stadium at Fullerton College (forward video to 1:40:30 for responses). The majority there believe the $10.1 Million District Stadium can and should be shared between the two schools. It is the best thing for the community. Fullerton College is a community college after all. It’s finally time the college works together with the high school and community of Fullerton to make the District Stadium FC’s home field for football and soccer matches. This would best serve the community in every possible way. 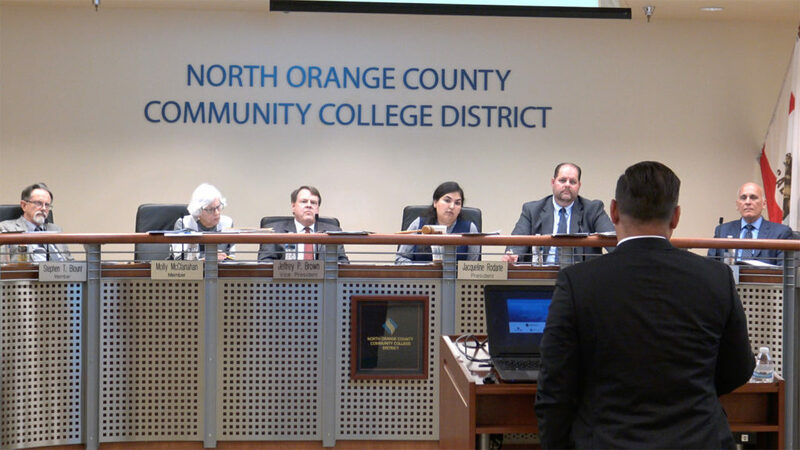 FJC Vice President Rodrigo (Rod) Garcia answers questions from Trustee Ed Lopez regarding why the college needs for more money to complete the EIR. 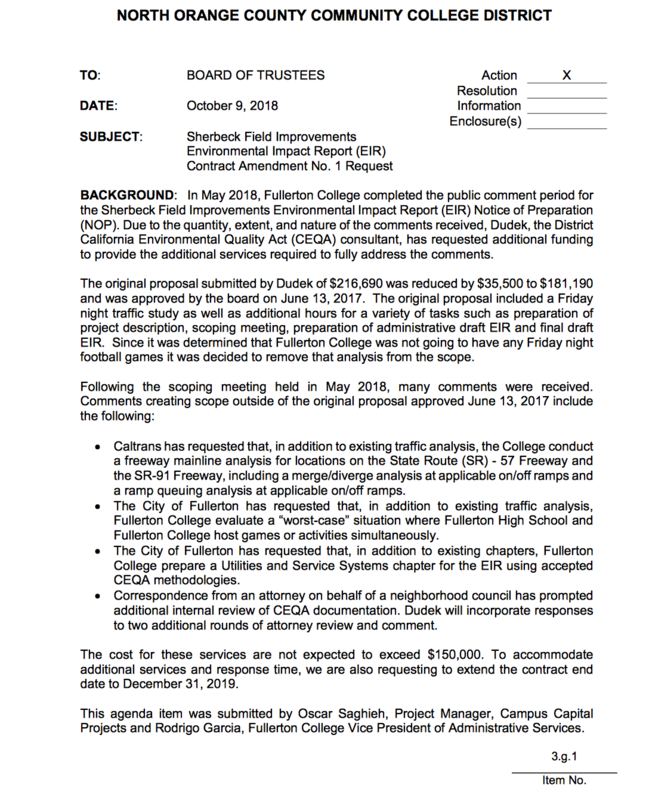 On Tuesday, October 9, 2018, the NOCCCD board of trustees voted 6-1 in favor of awarding Fullerton College an additional $150,000 to complete their EIR for the Sherbeck Field Improvements project. 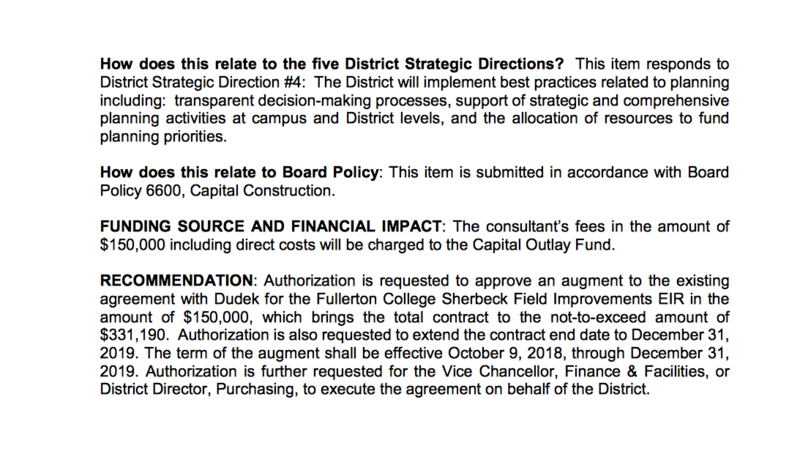 This now brings the total to $331,190 in fees for consultation and reports to bring a stadium to Fullerton College. 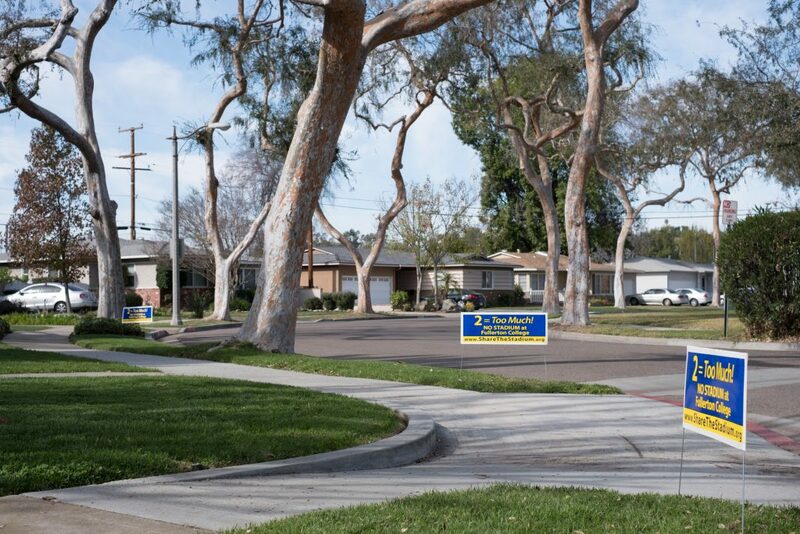 Show your support by proudly displaying a yard sign (or several) to show the college we won’t sit idly by while they pay for and conjure up the perfect environmental impact report. Submit your name + home address to: fedupwithfjc@yahoo.com or text your home address to: 714-873-5547 and we’ll get you a sign or signs for your yard right away. Feel free to leave any comments below. Thank you. 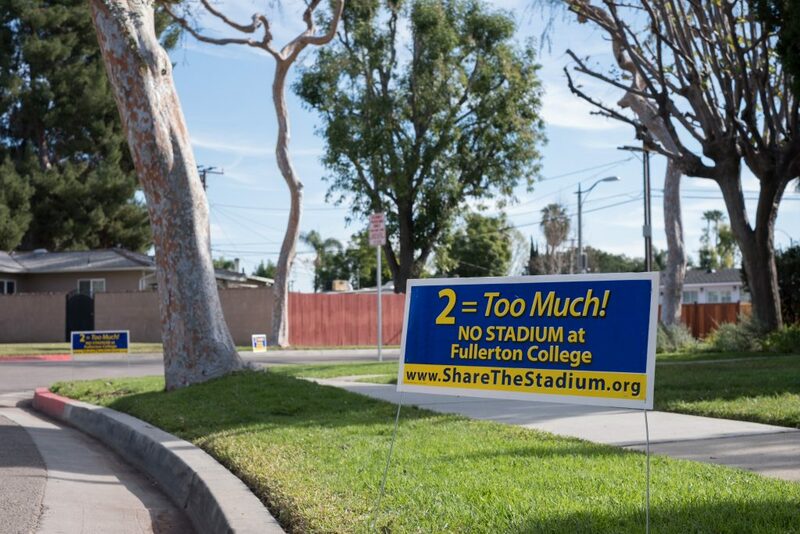 F.U.FC and this site exist to dispel Fullerton College’s fictional reasons why they suddenly need permanent lighting and 4,417 seats at Sherbeck Field. They will tell you it is for student instruction, when in actuality, Sherbeck Field Improvements is a disguise for a large, noisy, Stadium For Rent. Fullerton College would best serve the community by using the newly refurbished Fullerton District Stadium (at FUHS) or the taxpayer-funded Cal State Fullerton Titan Stadium (CSUF) for their 5 home football games.